Dr. Ron believes this is a key supplement for prostate health. Freeze-dried from grassfed New Zealand cattle. Contains all of the nutrients that naturally occur in a healthy prostate. 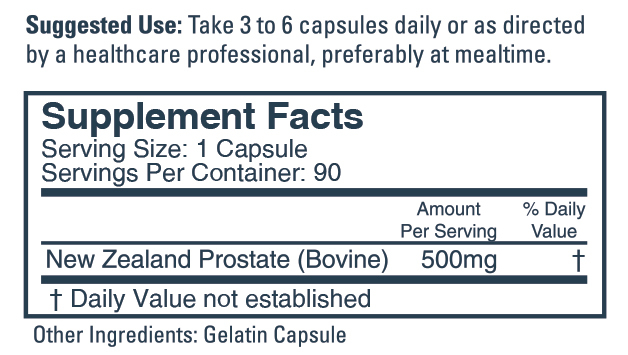 About an ounce of fresh raw glands are freeze-dried into six 500-milligram capsules. The suggested dose for prostate is one to three capsules daily. Radioisotope labeling studies in animals have shown conclusively that when eaten, organs and glands selectively travel to the corresponding organs and glands in the consumer in high concentrations. Eating organ meats played a central role in traditional cultures.